Coffee extraction is the process of dissolving soluble flavors from coffee grounds in water. Proper brewing of coffee requires using the correct quantity of coffee, ground precisely, extracted to the correct degree, controlled by the correct time and correct temperature. Also known as "solubles yield" or "Extraction Yield" – what percentage (by weight) of the grounds are dissolved in the water. Put simply, how much of the coffee in the brewer ends up in the cup. TDS is expressed in parts per million (ppm). The ratio of coffee grounds (mass) to water (volume): how much coffee is used for a given quantity of water. This may be expressed in units of either grams per litre or ounces per US half gallon. A subtler issue is which solubles are dissolved – this depends on solubility of different substances at different temperatures, changes over the course of extraction (different substances are extracted during the first 1% of extraction than in the period from 19% extraction to 20% extraction), and is primarily affected by temperature. 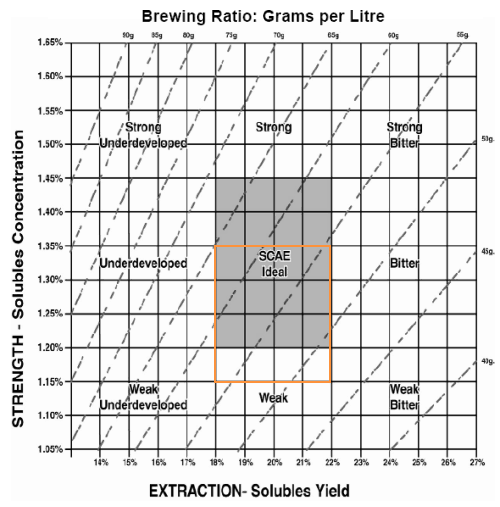 Brewing guidelines are summarized in Brewing Control Charts, which graph these elements, and center around an "ideal" rectangle indicating the target brewing range. The yield is the horizontal (x-axis), the strength is the vertical (y-axis), and a given brewing ratio determines a radial line, since for a given brewing ratio the strength is directly proportional to the yield. These guidelines apply regardless of brewing method, with the following exceptions: espresso is significantly different (much stronger, and more varied extraction), and dark roasts taste subjectively stronger than medium roasts (standards are based on medium roasts; equivalent strength requires using a lower brewing ratio for darker roasts). These components are addressed in turn. Ideal yield is widely agreed to be 20%±2% (18%–22%). 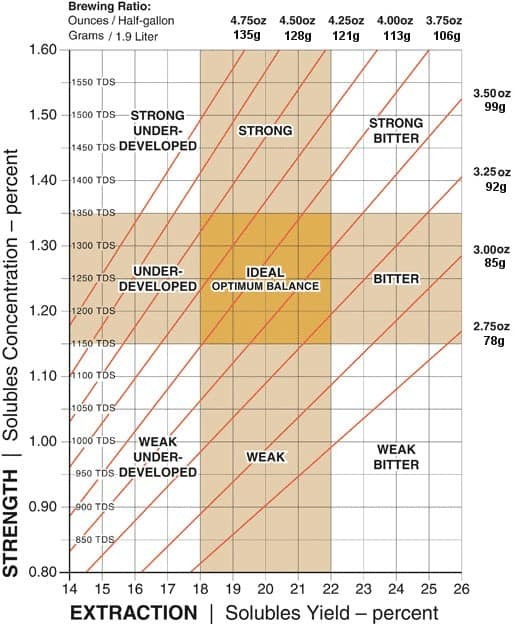 This was originally computed by the Coffee Brewing Institute, under the direction of Professor E. E. Lockhart at MIT in the 1950s, and has been verified by subsequent tests by the SCAA. Yields of under 18% are "under-extracted", specifically "under-developed" – desirable components have not been sufficiently extracted – and "unbalanced", specifically sour, because acids are extracted early, while balancing sugars (sweetness) and bitter components are extracted later. Yields of over 22% are "over-extracted", specifically bitter, as bitter components continue to be extracted after acids and sugars have largely completed extraction. In certain situations, yields surpassing 22% can be absent of bitterness. Yields depend primarily on temperature, brew time, and grind size, and in a complex way on method. Yield is inverse to grind size (smaller grinds have more surface area, so extract faster) and increases roughly linear with time, as the extraction proceeds. Thus for a given temperature and grind size, there is an ideal brew time, with larger grinds requiring longer brewing. French press features the largest grinds of conventional methods, hence the longest brewing, on the order of 3–4 minutes, while filter coffee has smaller grinds and shorter brewing, and espresso has yet smaller grinds and shorter brewing, on the order of 20–30 seconds. Caffeine is extracted early, so higher yields do not yield more caffeinated coffee, only over-extracted coffee. Once ideal yield has been reached, the grounds must be removed from the liquid, otherwise extraction continues and the coffee will grow increasingly over-extracted. For this reason, it is advised to pour out a French press when it has finished brewing, and percolators are frowned upon. It is possible to use less ground coffee and over-extract it to achieve a desired strength, which economizes on coffee but yields a bitterer, less tasty beverage. Water temperature is subtler but crucial to the proper extraction of flavor from the ground coffee, as it affects the proportions in which solubles are extracted – one wishes to extract the desired flavors as much as possible, and the undesirable flavors as little as possible. The recommended brewing temperature range of coffee is 91–94 °C (195–202 °F), which is a trade-off between these goals. If cooler, some of the solubles that make up the flavor will not be extracted. If the water is too hot, some undesirable, bitter, elements will be extracted, adversely affecting the taste. Note that this desired temperature range is slightly below the boiling point of water (100 °C or 212 °F at standard pressure), so coffee is best made with water that has been allowed to come off the boil slightly. Another consideration is the difference between the temperature of the water and the temperature of the coffee slurry: for example, certain brewing methods (e.g., manual pourover) can result in losing a significant amount of heat to the atmosphere during the brewing process. Transient temperature is not very significant: if coffee is heated to boiling point only very briefly, the taste will be little affected; the longer it is kept at a high temperature the worse the taste becomes. Strength refers to the amount of dissolved coffee solids per unit of coffee liquid volume. An espresso, specifically a ristretto, is the strongest of coffee drinks, meaning that it takes the same amount of coffee solubles and dissolves it in significantly less water. For example, a 20% extraction of 15 grams of espresso in a double shot (60 mL) yields 3 grams per 60 mL, or 5% strength, which is 3–4× typical brewed coffee strength. Adding water to dilute a drink after brewing affects strength but not yield (as the grounds are no longer present) – an Americano differs from an espresso simply by being weaker, more dilute (American preparation may also eliminate the crema). Stronger coffee (assuming the same extraction yield) is not more bitter than weaker coffee, but simply has more solids. This is reflected in being darker and in thicker mouthfeel (oilier), though mouthfeel also depends on suspended solids (very small grinds, so-called "fines"), particularly in French press as opposed to filter. Unlike yield, desired strength varies measurably between regions, and, assuming proper (20%) yield, strength is determined by brewing ratio – how much ground coffee is used for a particular drink. Coffee above the ideal may be considered "too strong", while coffee below the ideal may be considered "too weak", but individual tastes vary significantly. 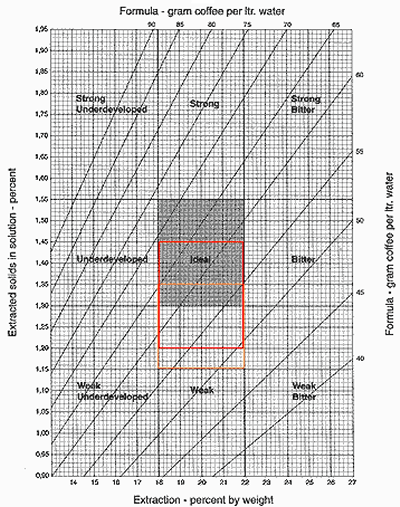 The usual ratio of coffee to water for the style of coffee most prevalent in Europe, America, and other Westernized nations (evident in publications such as textbooks on coffee and instruction manuals for drip-brew machines) is between one and two tablespoons of ground coffee per six ounces (180 millilitres) of water; the full two tablespoons per six ounces tends to be recommended by experienced coffee lovers. A more exact weight ratio of 1:17 coffee and water is also used in publications. The ideal brewing ratio is determined by which brewing ratio line in the control chart most intersects the ideal rectangle, or passes through the center (the subtle distinctions about exactly which line is ideal is generally considered too minor to comment, and changes brew ratio by only a small amount). This ideal ratio makes it most likely that one will land in the rectangle and near the center, and gives the widest room for error. Extraction depends in subtle and complex ways on brewing method. Simplest is directly mixing the grounds and water, as in cupping, press pot, and vacuum brewing. Note that in Turkish coffee, the grounds are very finely ground and not removed from the water – this yields essentially 100% extraction of the solubles (over-extraction by Western standards), and suspension of the remaining insoluble parts of the grounds in the water. Significantly more complicated is brewing via soaking a column of grounds, as in filter, espresso, or percolation – in this case the water soaks and moves through the column of grounds, and (if there is water on top, as in espresso or percolation), a gradient develops over the column. Espresso yield is generally 15–25%: 25% is quoted as the Italian extraction in (Illy 2005). Espresso yield has received significantly less attention in the literature than brewed coffee extraction, with the main references being (Illy 2005) and (Schulman 2007). strength is independent of dose. Strength depends instead on grind: finer grinds yield a "shorter" (ristretto) espresso (less liquid, so higher brew ratio, at same yield gives more strength), while coarser grinds yield a "longer" (lungo) espresso, while an intermediate grind yields a "normale" espresso. ^ "The EK43 Part Two - Matt Perger". Matt Perger. Retrieved 2016-04-13. Illy; Vianni (2005), Espresso Coffee: the Science of Quality, Chapter 7, by M. Petracco. This page was last edited on 23 April 2018, at 19:20 (UTC).